Uyghurs take food 3 times a day traditionally. Though there are people who take dinner in the day time nowadays, Uyghur tradition is to have light refreshments of naan and tea in the morning and at noon and then dinner in the night. They sit by dastikhan (laid out table cloth) in status order and have dinner. Uyghurs take wheat and rice as principal food and they relish meat and dairy products. There are variety of dishes such as naan, pilaf, noodles, buns and grilled meat. Fruits are well consumed there and they relish melons, watermelons, grapes, apples, pears apricots and pomegranates. The meat often taken are beef, mutton, chicken and duck. Pork, donkey, carnivore, bird of prey, dead animals and meat without Islamic blood letting are religiously taboo to eat. The tea called Chay has been taken by people in East Turkistan traditionally and it is often served with milk. Naan and tea are the first thing to be served to a visitor. Chay is made of tea leaves called qara chay (black tea). The tea leaves , spices and the way of serving vary in different tribes and regions. 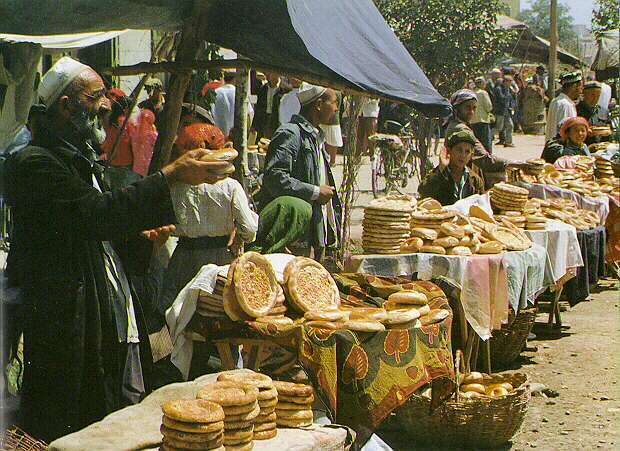 Naan is an essential foodstuff in East Turkistan with history of 2,000 years. It's main ingredient is flour and sesame, onion, egg, vegetable oil, butter, milk and etc. can be added. There are many recipes and the ingredients vary. The biggest naan in East Turkistan is called hemek naan with its size 40-50 cm across. It requires 1-2 kg of flour to make the big hemek naan and the naan is generally served on festivals and wedding ceremonies. The smallest naan is toqach naan, 10 cm across and 1 cm thick. It is consumed daily and it is also taken to a trip as preserved food. In regend, the naan was carried by the Tang Monks who travelled across Gobi desert on search of Buddhist Scriptures. Girda naan is a thick naan with a hole in the middle. The naan with crispy surface and doughy texture inside is popular in East Turkistan. 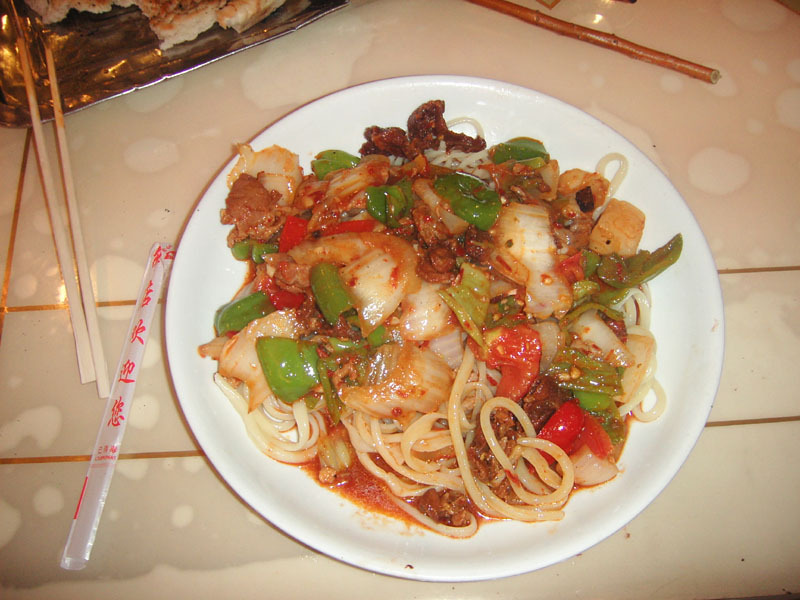 Noodles made of flour are popular among Uyghurs. Famous noodles there are lagman, ughure and suyuqash. Lagman is one of the favorite principal foods and it is palatable for others, too. The dough is made of flour, water and salt and it is stretched by hand until thin. Sauce is made by mutton, seasonal vegetables stir-fried with tomato sauce. The noodles are served with the sauce on top. Lagman is a common dish in Central Asia but they way it is cooked is different in East Turkistan and West Turkistan. Lagman in East Turkistan is chewy and served with fried sauce, while lagman in West Turkistan is less sturdy and served with juicy sauce. Polo is one of Uyghurs favorite traditional dishes. It is cooked for distinguished guests and it is most often served on ceremonial occasions. The ingredients are spices, oil, meat, rice, onion and salt. They stir-fry the meat, vegetable, add rice, water and salt and then steam it for 40 minutes. The meat on the rice is mutton, beef, horse, chicken duck or goose. Polo is served on a tray and eaten by hand. Cold dishes like yogurt and fresh vegetables are often served together. Kawap is roast mutton on skewer, widely known as Shish Kebab. It is a traditional Uyghur dish popular as a snack. They put the sliced meat and fat on iron skewer alternately, sprinkle chili, salt and cumin. It is grilled over charcoal for a few minutes.